Architecturally designed to take advantage of the breath-taking ocean views, Tides Apartments Port Fairy provide the perfect location for a mid-week break, weekend or extended getaway. All have spacious decks and/or enclosed outdoor courtyards that take advantage of the summer and winter sun. Tides offers fully self contained luxury accommodation, choose from 2 deluxe one bedroom apartments or a stylishly appointed three bedroom townhouse. All have spacious decks and/or enclosed outdoor courtyards that take advantage of the summer and winter sun. Superbly located, Tides is approx 150m from Pea Soup Bay, a safe swimming beach with crystal clear waters, and a leisurely 15 -20 minute stroll to the town centre where you can enjoy a coffee or dine at one of Port Fairy’s quality cafes and restaurants. 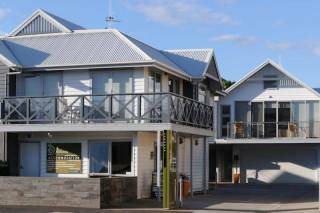 BOOKINGS: To avoid any confusion regarding your booking we strongly recommend that you visit our website: www.tidesportfairy.com.au and take a few minutes to view the accommodation. The description given is in good faith and we will accept no responsibility for any changes to properties, or misconceptions of properties based upon bookings made without inspection. Bookings are made in good faith and are subject to specified terms and conditions. The management of Tides Apartments reserves the right to refuse tenancy if breaches to the terms and conditions are evident. All reservations are subject to owners approval. The owners may cancel reservations at any time including reservations with deposits in place or paid in full. Please note should this occur all effort would be made to find alternate accommodation. All prices are correct at the time of quoting/booking. The owner reserves the right to change the rates at anytime. If no payment has been received you will be advised of the increase and have the choice of continuing with the booking. Every effort is made to keep inventories and photographs up to date however; changes can be made without notice. The Owner / Agent will not be held responsible for failure of utilities and essential services such as electricity and hot water, should it cease to function. However, upon appropriate notification, every attempt will be made for appropriate action. WEDDINGS, PARTIES...ANYTHING: Parties and Functions are strictly prohibited. The price charged is for domestic use only and not commercial. Accordingly this rate does not allow for the extra wear associated with functions in terms of cleaning, garbage removal, wear and tear, repairs etc. Use contrary to this may result in loss of your bond and/or additional payments. ARRIVAL AND DEPARTURE: In peak season, check in is 3pm and check out is strictly 10am on the day of departure. In mid and low season, the check in is 2pm and check out is 10am. A $30.00 per hour penalty fee will be charged for late check-outs unless prior arrangements have been organised. Late check outs are not available during peak periods or for back to back bookings. Early arrival may be permitted by prior arrangement. Departure - the property should be left in a similar state to its condition on arrival. Check-out time is 10.00 am by the latest, to allow time to prepare property for next guests. KEYS: Keys are to be collected from Bella Claire Café, 28 Bank Street between 3:00pm - 4:30pm (summer) or 2:00pm - 4:30pm (winter) on your arrival date unless prior arrangements have been made. All guests are responsible for the safekeeping of accommodation keys/remotes and call out fees are payable if a replacement key is required. If keys/remotes to accommodation property are lost or damaged by the guests you are responsible for the cost of full replacement set of keys and garage remotes. SMOKING - All properties are non-smoking without exception. CLEANING - The property is to be left as you found it with all dishes washed, dried thoroughly and put away and all food removed from refrigerator and cupboards. Dishwashers are to be left empty. Any nauseous cleaning will incur a charge at the discretion of the management. A cleaning charge of $35 per hour will be incurred if this condition is not adhered to. After use, please clean the BBQ - a splash of beer and a quick rub with newspaper should suffice. DAMAGE/REPAIRS/LOSS - As a guest, you are responsible for all damages, breakages and losses incurred during the term of your occupancy. All damages, breakages and losses must be replaced, paid for or made good to the satisfaction of the owner/agent. This includes replacing lost keys. RUBBISH BINS - Rubbish bins are to be placed out each Sunday evening when occupying the property. There are 2 bins: Red bin is for the general waste and the Yellow is for recycling. Please use the bins as appropriately indicated. TARIFFS - Are current and subject to change without notice. No responsibility is accepted for errors and omissions on the website or verbally. NOISE/NUSIANCE - Immediate termination may apply in the event of unnecessary or excessive noise, nuisance or disturbance caused to neighbouring properties during your occupancy. Dangerous and reckless behaviour by tenants or their guests will result in immediate eviction from the property without refund. PETS - Animals and pets are not permitted on the premises under any circumstances. PERSONAL PROPERTY - Please remember to take all personal belongings with you upon departure. No responsibility will be accepted by the Agent/Owner for any personal possessions left after departure. Any items left behind that need to be returned to you will be sent C.O.D. (cash on delivery). We agree to hold item(s) for a period of 2 weeks, after such time the item(s) will be donated to the local op-shop. AFTER HOURS ASSISTANCE - For urgent after hours assistance, please call 0488 992 894. A call out fee may apply in these circumstances. 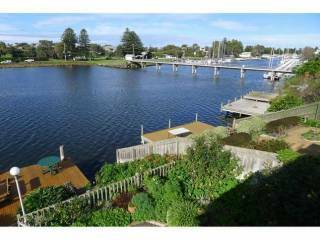 BOOKING SIGHT UNSEEN - We encourage guests to view properties online at www.tidesportfairy.com.au prior to booking. DOUBLE BOOKING - If a double booking occurs (Note: this is extremely rare but human error can occur), the first booking taken will take precedence and if available, every endeavour will be taken to find you an equivalent property. If we have no properties available, we will do our best to outsource a property if a property cannot be found your deposit will be refunded in full. BOND: Credit card details will be held in lieu of a bond. The guest agrees to a pre authorisation of their credit card to be held by Tides Apartments Port Fairy as a security deposit and they authorise any charges to be charged to this credit card, without notice or demand, in the event of any loss or expense arising from breach of their agreement to rent the property, their occupation of the property or damage to the property. Tides Apartments accepts payments via credit card (MasterCard or Visa), cash or bank account transfer. Payment in full is required at the time of booking to secure the reservation. Payment constitutes the clients acceptance of these Terms and Conditions. 1.All notifications for cancellation of a booking are to be in writing and will incur a $100 administration fee. 2.If your booking is cancelled 3 months or more prior to your arrival date all funds will be refunded minus the administration fee. 3.If you cancel your booking within 3 months of your arrival date any refund is subject to re-booking the premises for the same time as your booking. Refunds following cancellation may only be available if and when period cancelled is fully rebooked for the total period and equal amount of tariff. 4.Any cancellations made 30 days or less prior to your arrival will result in forfeiting all monies being the full rental and charges levied. 5.A change of booking dates or a change to another property attracts the same conditions as listed above. 6.No refunds for early departures or shortening of stays.